DC Rock Club: John Foster Are You Watching? had to check BYT first to make sure this hadn't yet been covered (so to speak). there's a raging debate about tights going over there. That's the best use of a baby on a cover since Lil Wayne. I think Moz got the idea after seeing the photos at http://www.dcrockclub.com/2008/01/posterized.html. That typography is the shits unless you are opening an old school ice cream counter complete with a player piano. Thanks for the headline boys! I promise to bring some music back to byt next week. 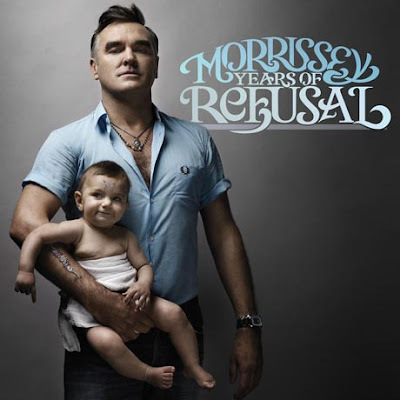 Most of those debates for me should start with "you shouldn't wear this UNLESS you are insanely hot..."
i do wonder what's on moz's arm, some padma lakshmi type deal? His arm scar-fruit rollup-thingee instantly reminded me (and I'm guessing Sacklunch as well) of Padma. Maybe he's a huge Top Chef fan. Moz and his little friend could judge a quick fire challnge featuring the wonderful line of Gerber foods. btw, i'm going to AT LEAST five shows when he tours, hopefully more. hopefully i will get up the nerve to rush the stage and get tackled by one of his security people. Did you ever watch "NY Doll" about Arthur 'Killer' Kane? It's got the first interview I've ever seen with Morrissey. He's surprisingly charming. Then again he is British.